Published: Nov. 23, 2014 at 10:02 p.m.
Dallas Cowboys quarterback Tony Romo's fumble is recovered by New York Giants defensive end Jason Pierre-Paul. Published: Sept. 25, 2014 at 08:42 p.m.
New York Giants defensive end Mathias Kiwanuka strip sacks Washington Redskins quarterback Kirk Cousins; Giants recover. 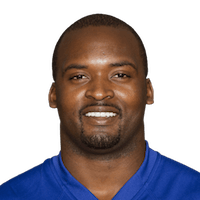 Published: Dec. 23, 2013 at 04:14 a.m.
(7:49) R.Bush left tackle to NYG 43 for 2 yards (M.Kiwanuka). FUMBLES (M.Kiwanuka), RECOVERED by NYG-A.Rolle at NYG 41. A.Rolle to DET 49 for 10 yards (K.Ogletree). Published: Dec. 22, 2013 at 05:10 p.m.
Detroit Lions running back Reggie Bush fumbles. It is recovered and returned 10 yards by New York Giants safety Antrel Rolle.